These are being freely provided for personal study, but we also aim to raise funds for the Rumtek Nuns. Texts are downloadable as PDF files formatted in A4 for ease of printing. Traditional bound copies are also available for purchase at the centre. Because of our creative efforts to further develop new text in spoken word, new versions may appear. This is an ongoing process and this page will reflect that process. This text from Coorain includes three separate liturgies intended for group or individual recitation. Some explanatory notes are included. 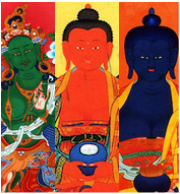 The pujas are to Green Tara, Amitabha and Medicine Buddha. 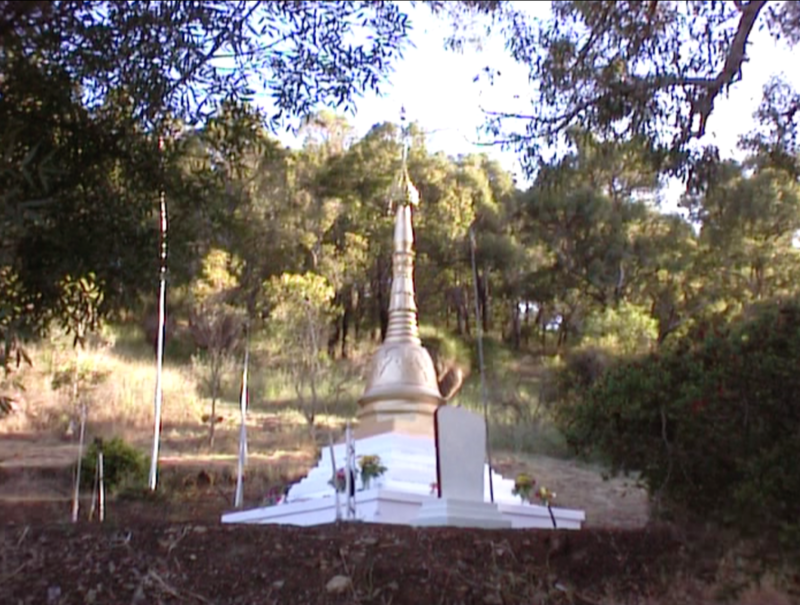 A recent recording of Coorain practitioners reciting the Three Pujas text. This version is from April 2016. This is a beautiful collection of prayers, offerings and invocations. 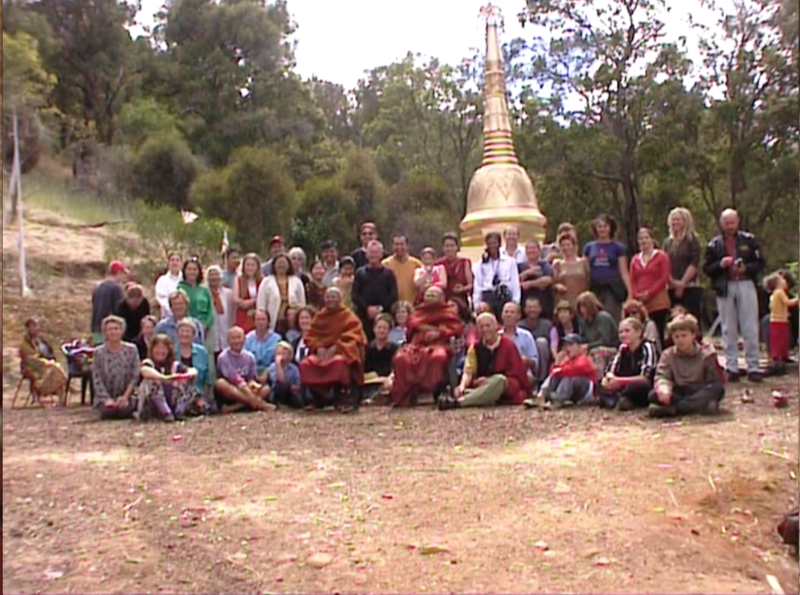 They are aimed at activating and strengthening 'The Heart for Awakening', a quality known in Dharma as Bodhicitta. The introduction contains a brief history of the lineage at Coorain. This is a teaching text recited weekly at Origins. It presents and clearly explains the most fundamental teachings of the Buddha such as the Four Truths and the Eight-fold Path. It contains traditional Pali language with translation and elucidation in modern English. 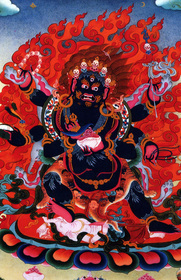 Mahakala is an aspect of Chenrezig, and a powerful embodiment of fierce compassion. for confronting and transforming negative emotion. This version is from April 2016. We have omitted the drums and bells that are indicated in the text, due to the sensitivity of our recording equipment. Hopefully they will appear in future versions. 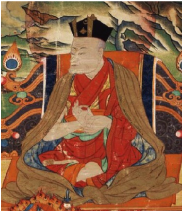 The Khadampa teaching is a an important but almost forgotten source of the Karma Kagyu tradition. It was given to the warring rulers of Eastern Tibet in the 11th century CE by the Bengali sage Atisha, to return dharma to this region and end a bitter conflict. Emphasising the harmony of all peace-oriented teaching, it empowered the lay community and enabled dharma to integrate with indigenous culture. Through practice it strongly establishes a the vow for peace. The text explains the seven points in a variety of ways and is intended for both study and recitation. 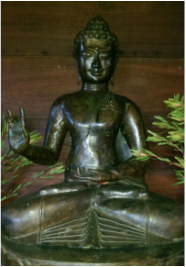 This is a collection of instructions and discourse on classical mindfulness practice. as well as well as teachings on common obstacles and hindrances to practice. to share the method with others. 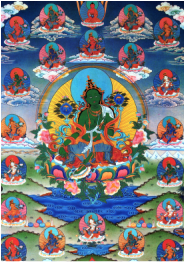 This short text is a prayer to the different aspects of Tara that manifest as sources of wisdom and guardians of the natural world. This recording by Coorain practitioners is from April 2016. This is a teaching aid for the Ngon-Dro, the foundation work of the Karma Kagyu lineage. It is a codified and tested method for training the imagination in the service of Dharma. Ideally this work should be done under the guidance of an experienced teacher. The text contains detailed practice notes and a glossary. Filmed and edited by Em during a recent stay at the Nunnery in Sikkim, these show the Karma Kagyu nuns and monks of Rumtek performing traditional Buddhist ceremonies for the community, providing guidance and spiritual wellbeing. The Nuns often give refuge to girls in need. We have offered essential support to the nuns for some years now. Any donations go entirely to their practical welfare. The videos can be watched on the page or downloaded to your computer. This traditional Burmese structure has been a distinctive and much cherished feature at Origins since its construction in 2001. 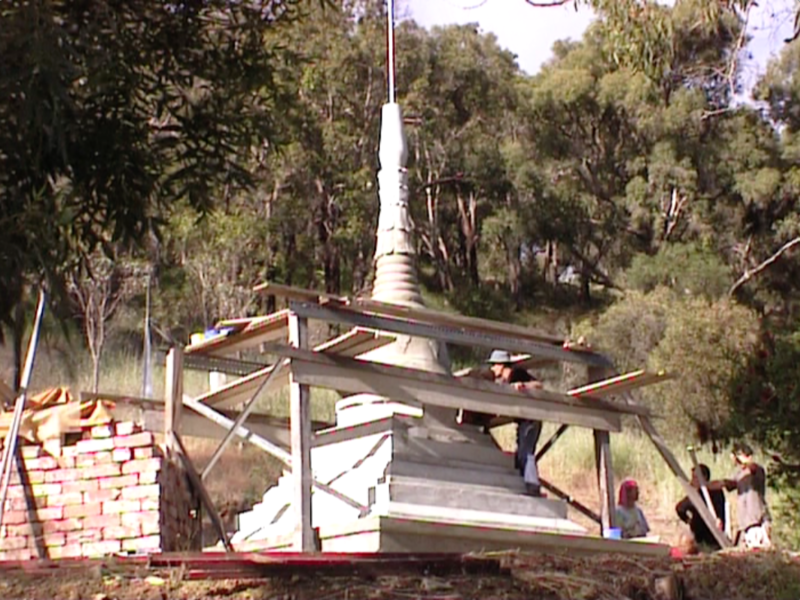 The project was a massive undertaking, involving visitors from Burma, members of the Mon Burmese community in WA and many local volunteers. This 20 min video was shot and edited to a professional standard by Alan Clark and gives an informative account of the process - from groud-breaking to final adornments, and the dedication ceremony and celebration. Origins continues to commemorate the completion each year during the first weekend of December. Here we will be offering creative work that represents the evolution of dharma. Friends and practitioners around the world are finding new approaches to the teachings in ways that reflect our contemporary situation, whilst acknowledging and respecting traditional lineages. This website is run by a Canadian Dharma group that shares the same lineage as Coorain. Cecilie Kwiat was an early student of Namgyal Rinpoche who became a much beloved teacher. This website has an archive of her recorded talks available for download where she expounds an accessible, universalist dharma teaching. Broadly speaking, Tibetan 'sadhanas' are practices that imagine archetypes and symbols to explore themes of awakening compassion.They belong into the global culture of sacred art and theatre. Creative response is an essential feature of this type of practice, usually experienced within each individual. Here, each particular sadhana has been workshopped by a group of Coorain practitioners and expressed as 'shrine installations'. This slideshow is a record of some of the collaborative artworks created over a three-year period. Leila Adu is a New Zealand composer and singer respected for her wide-ranging, informed and original approach to music. In 2015 she wrote a symphonic song cycle to the wonderful plainsong 'Blessings Fall as Rain' by the late Ven. Kalu Rinpoche, and revised in English by Lama Chime at Coorain. Leila called her piece "Rain as Blessings Fall'. Its premiere performance was on June 20th 2015, with Leila and the Wellington Symphony Orchestra where Leila is a resident composer. She is currently completing a PhD at Princeton University and performs globally. Here is a fascinating and heartwarming glimpse into the daily lives and stories of these women and girls through their own words and images. They have previously been available in hard copy at Origins, but have been scanned and reproduced in PDF form to share and raise awareness. This is a valuable project, facilitated by friends of the Centre, and will be developed further. These poems arose from the practice of Vajrasattva, the Diamond Being - a Tibetan Buddhist teaching on purity. Contemplating the iconic, symbolic form of Vajrasattva (included at the back of the poems) allows a creative response to arise. This collection is a free-form expression of such a response. Freely given time, material goods and financial support make up the everyday economy of Origins Centre.